To commemorate the strength and triumphs of the Tudor dynasty, Henry VIII commissioned from Holbein a wall-painting for Whitehall Palace; this was completed in 1537. The immediate impetus for the commission may have been the birth or the expectation of the birth of Henry's son Edward, later Edward VI, in October 1537. The mural may have been in Henry's Privy Chamber and therefore have had a select, restricted audience rather than being an image of wider propaganda. 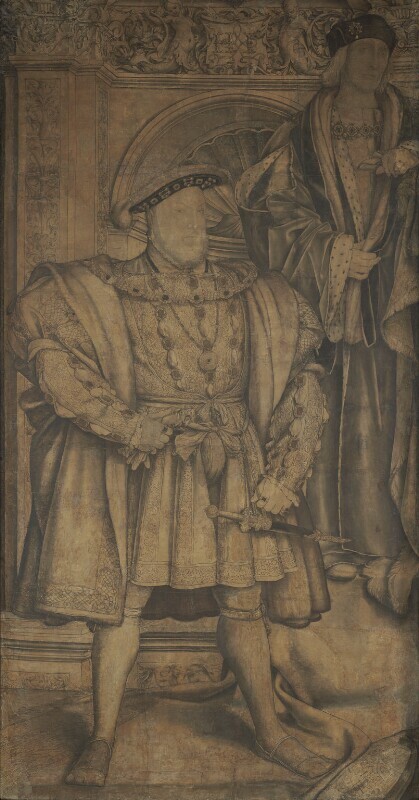 This very large drawing is the preparatory drawing or cartoon for the left-hand section of that wall-painting, and shows Henry with his father Henry VII, the founder of the dynasty. The right-hand section showed Henry VIII's third wife Jane Seymour (1509?-37) and his mother Elizabeth of York (1465-1503). Holbein's painting was destroyed in the Whitehall Palace fire of 1698, and the cartoon for the right-hand side section is lost. The appearance of the whole painting is however recorded in a mid-seventeenth century copy by Remegius van Leemput in the Royal Collection. The cartoon is executed in black ink and watercolour on several sheets of paper joined together. The figures and faces of the kings are cut-outs pasted on to the backing paper. The cartoon is exactly the same size as the finished painting and was used to transfer Holbein's design to its intended position on the palace wall. To do this the cartoon was pricked along the main outlines of the composition and then fixed in the intended position on the wall. Chalk or charcoal dust was then brushed into the holes made by pricking, thus transferring the outline to the wall. Holbein could then proceed with filling in his design. Anne Boleyn miscarries a male child. She is accused of adultery and beheaded for High Treason. Henry marries Jane Seymour eleven days after the Anne's death. The Act of Succession declares Mary and Elizabeth illegitimate. The Act of Suppression marks the beginning of the dissolution of the monasteries. Pilgrimage of Grace popular rising against Henry VIII's Church reforms and the economic effects of enclosure. The German artist Hans Holbein the Younger makes a large preparatory drawing, (cartoon) of King Henry VIII for the Whitehall Palace wall painting. The French Protestant reformer Jean Calvin publishes Institutio Christianae Religionis (Institute of the Christian Religion), the founding text of the Calvinist churches. Francis I of France conquers Savoy and Piedmont.